"We need to fail down here so we don’t fail up there." Oscar-winning director Damien Chazelle dramatizes astronaut Neil Armstrong using an unconventional, naturalistic docudrama style shot mostly on grainy 16mm film that proves much more immersive and deeply psychological. 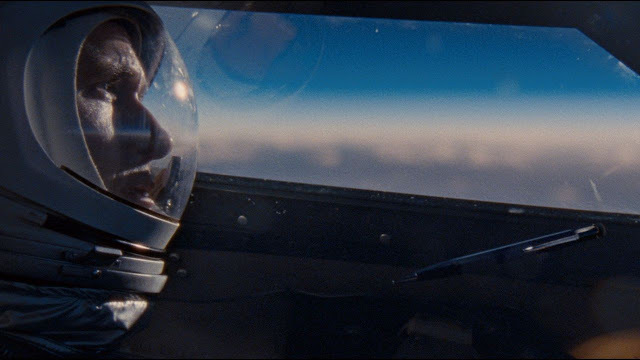 In First Man, A very soft-spoken Ryan Gosling seems almost too fitting an understated vessel for the reluctant American hero who was a man of few words and rarely showed his emotions. Chazelle and screenwriter Josh Singer frame Armstrong's life as a reaction to the grief of losing his young daughter and how his cool demeanour and focus propelled him to the moon. We see the NASA space program from Project Gemini to the eventual Apollo missions entirely through his unique perspective following his life from California test pilot in 1961 to commanding Apollo 11 in 1969. Claire Foy as Neil's wife Janet manages to create a strong arc in opposition to the deeply repressed perspective of her husband. It's a powerful performance that fights against the long-suffering housewife to a great man archetype of the time as she shows her clear power. They are really the only two characters who get any emotional arc as many different real-life players come and go in their lives. The cast is littered with middle-aged white male character actor all-stars playing other astronauts and space officials including Jason Clarke, Kyle Chandler, Christopher Abbott, Patrick Fugit, Lukas Haas, Shea Whigham, Ciarán Hinds, and Corey Stoll as a surly Buzz Aldrin. They all weave in and out of the film with little explanation only scene through Armstrong's insular experiences. It makes the eight-year journey, training, and work of space travel all the more documentary-like. The film is such an intimate, dizzying experience that takes a tragic, somber view of the trials on the way to triumph. Based on James R. Hansen's biography, it's a very insular feeling portrait about an important historical figure told through loss. Linus Sandgren's fluid cinematography in tandem with the meticulous practical effects, detailed production design, and pulsing musical score from Justin Hurwitz ably captures the era's defining spirit of exploration so dramatically. First Man is a fleeting but beautiful biopic of the first man to walk on the moon. It's artistic and introspective in recreating the feeling of space travel. Chazelle brings a classical hand to crafting the immaculately constructed film almost devoid of conventional narrative framing. It's technically impressive and unromantic in a way that focuses on its fractured performances for authenticity.